Annan collected a much needed three points against second placed Elgin in a tense match which saw Annan score the only goal of the match, a 4th minute McKenna strike in a game which retained the fans attentions until the final whistle. 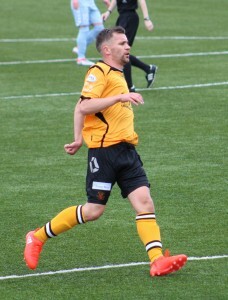 The line ups for both teams showed changes, Annan included a trialist and with Black and Watson still dogged by injuries it meant a starting spot for Stephen Bronsky at the heart if the Annan defence alongside Stephen Swinglehurst who made a welcome return after the injury sustained in a previous match against Montrose. Also out due to injury was loan player Aiden Smith and Ellis Pearson made his home debut on the bench. Elgin City also had injury problems with centre half Mark Nicholson still nursing a knee injury and Craig Gunn and Daniel Moore making a return from the bench following their late defeat at home against Stirling last week. Annan started promisingly with the strong sun in their eyes on a cold brisk day and inside 2 minutes Max Wright’s low effort hit the side netting. It was an early warning for City as 2 minutes later Annan opened their account when top scorer David McKenna latched on to a Max Wright through ball and his shot from 10 yards nestled in the top corner of the net past Waters. It was an awful start for Elgin but they responded superbly taking the game to Annan. Blair Currie denied the visitors an equaliser on the 12th minute when he pulled off a double save to deny Brian Cameron and then Chris Mcleish. Elgin continued to press forward trying to break down Annan’s defence, in the 16th minute Chris McLeish tried his luck with an effort from the edge of the box but the shot sailed over the bar. Annan responded with a well worked move down the right ending with David McKenna shooting narrowly past after connecting with Rabin Omar’s low near post cross. Annan’s trialist headed narrowly past the post from a Ramsay free kick in the 25th minute. Daniel Moore created the best opportunity for Elgin in the 30th minute when he cleverly skipped past the challenge of Bronsky to finish with a fine effort which Currie tipped on to the bar and somehow the Annan goal survived unscathed. The game continued to ebb and flow, Rabin Omar cut along the bye line cutting the ball back into the path of the trialist who’s low shot was easily saved by Marc Waters. Elgin won a free kick from a promising position 30 yards out but Craig Gunn’s awfull effort went high and wide. Rabin Omar missed a golden opportunity to double Annan’s lead in the 40th minute when he rose unchallenged at the back post to connect with Darren Ramsay’s corner but the header sailed over the bar for the miss of the match. Ramsay’s early shot at the start of the second half went past the post and Swinglehurst’s timely interception in the 57th minute ended a promising Elgin attack, minutes later Elgin were relieved when Annan had a well worked goal chalked offside when the trialist set up Rabin Omar who’s low shot cannoned off the base of the post across the face of the goal to David McKenna who slotted into the net. Elgin continued to press forward looking to break down Annan’s resistance and they had claims for a penalty brushed aside in the 67th minute following a Daniel Moore corner kick. Jean Guy Lucas created a promising opening setting up the trialist when he cut the ball back into his path but the effort went wide of the target. Kyle McLeod headed past the post as the Annan defence came under heavy pressure with Elgin going all out to save the match but scoring chances were rare with Annan defending resolutely. As the game entered the closing stages Annan broke down the left when Krissian intercepted a stray ball and his cross picked out Ramsay who’s poor shot was blocked from a very inviting position. Elgin pushed forward in a last ditch effort to break down Annan’s defence but the early goal proved to be defining moment in a highly entertaining match and for the time being the 3 points gained by Annan pushed them up into 5th place in the league but there is a real battle in place for survival with only 5 points separating the bottom 6 teams. ANNAN ATHLETIC: Blair Currie, Jean Guy Lucas, Steven Swinglehurst, Ryan Sinnamon, Stephen Bronsky, Barry Cuddihy, Rabin Omar, Trialist (Aaron Bradbury 85 min), David McKenna (Callum Home 90 min), Max Wright (Raffi Krissian 80 min), Darren Ramsay. Subs not used : Alex Mitchell, Ellis Pearson, Prezmyslaw Dachnowicz, Tony Ribero. ELGIN CITY : Marc Waters, Mathew Cooper , Archie McPhee, Darryl McHardy, Kieron Stewart , Thomas Reilly , Chris McLeish ( Kyle McLeod 65 min), Brian Cameron, Craig Gunn (Chris Dodd 60 min), Shane Sutherland, Daniel Moore. Subs not used : Errol Watson, Robbie Bruce , Ben Cullen. REFEREE: John McKendrrick. ASSISTANTS Stephen Mitchell and Ryan Lee .